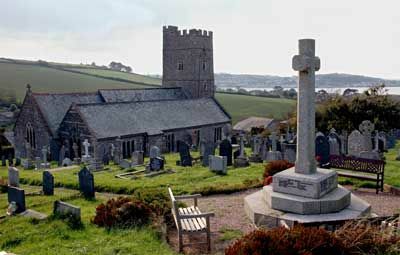 Instow's War memorial stands at the very heart of the burial ground surrounding the church of St. John the Baptist. There are seats for those who wish to stay a while and a view of the sea for a backdrop - all in all, a very beautiful and peaceful place to remember the fallen. The memorial consists of a simple granite cross standing on a triple plinth; names and inscriptions are inscribed on the four faces of the upper level of the plinth which is square. "TO THE GLORY OF GOD AND IN MEMORY OF THE OFFICERS AND MEN OF THIS PARISH WHO GAVE THEIR LIVES FOR THEIR KING AND COUNTRY IN THE GREAT WAR"
Private Thomas Reginald Barrett of the 1st Battalion, the Devonshire Regiment. Son of the late William Henry and Elizabeth Davie Barrett. Born in Rangoon but grew up in Instow. Died 24 October 1914 aged 19. Lieutenant Robert Charles Chichester of the Royal Navy, HMS Black Prince. Son of Catherine, Lady Chichester, of The Bungalow, Instow, and the late Rear-Admiral Sir Edward Chichester, Bart., C.B., C.M.G. Born at Rose Cottage, Instow in the December Quarter of 1889. Died 31 May 1916 aged 26. Captain (Adjt.) Rupert Cholmeley Yea Dering of the 2nd Battalion, the King's Own Scottish Borderers. Son of the late Col. Edgar Dering and Mrs. Dering, of Standfield, Instow, and husband of Helen Fitzgerald. Born in Cork, Ireland in 1884. Died 19 April 1915 aged 31. Captain Reginald Pole Hayes of the 6th Battalion, the Somerset Light Infantry. Son of William and Ellen Hayes and husband of F. Hayes of Indututu, Umzinto, Natal. Born at Loventor, Berry Pomeroy, in the September Quarter of 1885. Died 12 March 1916 aged 29. Sergeant Ernest James McGrath of the 1st Battalion, the Devonshire Regiment. Born in Jersey. Died 14 April 1917. 2nd Lieutenant Thomas Theodore Norrish of the 1st Battalion, the Devonshire Regiment. His birth was registered at Crediton in the December Quarter of 1896. Died 13 September 1916 aged 20. Captain Hugh Rivers Hamilton O'Brien ("Paddy") of the 112th Battery the Royal Field Artillery. Son of Lt. Col. J. O'Brien (I.M.S.), and Mrs. O'Brien, of Newstead, Instow, Devon. Died 1 June 1916 aged 25. Captain Walter Gerard Palmer of the 113th Indian Infantry; seconded to the Royal Flying Corps. Died 5 March 1916 aged 32. Of Indian Nationality. Private W E Rowland of the 4th Battalion, the Middlesex Regiment. Died 7 July 1916. Captain Leonard Slater of the 2nd Battalion, the Royal Sussex Regiment. Son of the Rev. Francis Slater and Mrs. Harriet Slater; husband of Constance Dorothy (formerly Pridham) of Instow. Born in Instow in the December Quarter of 1875. Died 14 September 1914 aged 38. Lieutenant P Smith of the 12th Squadron, the Royal Flying Corps. Died 28 April 1917. 2nd Lieutenant Sergius Holland Smith of the 4th Battalion, the South Staffordshire Regiment. Born in Russia in 1892 but grew up in Kings Nympton. Died 24 November 1915 aged 23. Private William Balkwill of the Connaught Rangers. Son of Samuel and Ellen Balkwill (sometimes Balkwell) and husband of Mabel Hannah Balkwill of 1 Marsh Cottage, Instow. Born in Bideford in 1882. Died 26 February 1919 aged 36. Buried in the churchyard at Instow. Commander Julius Albert Lane of the Royal Navy, HMS Columbine. Son of Mr. and Mrs. Albert Lane of London. Born in Kensington in the September Quarter of 1867. Died 19 October 1915 aged 48. Major M. H. B. Morgan of the South Lancashire Regiment. Died 22 November 1917. Private Eli Pidler of the 25th Battalion, the Machine Gun Corps. Son of Christopher and Helena Eliza Pidler, of Torridge Vale, Instow. Born in Georgeham in the March Quarter of 1899. Died 13 September 1918 aged 19. Lieutenant Colonel G. F. Pridham of the 1st Battalion, the Welsh Regiment. Died 16 December 1916. Private Richard Ridd of the 8th Battalion, the Devonshire Regiment. Husband of Winifred M. Ridd (formerly Buzzacott) of Worlington, Instow. Born in the December Quarter of 1892. Died 17 October 1919 aged 28. Buried in the churchyard at Instow. Lieutenant Richard Chichester Beckwith of the Royal Navy, HMS Prince of Wales. Son of Edward Hornby Beckwith and Janet Beckwith (formerly Chichester) of Instow and husband of Yvonne Rosemary Beckwith (formerly Pridham) of Fleet, Hants. Died 16 February 1942 aged 28. Sergeant Reginald Henry Beer of the RAF Volunteer Reserve. Died 5 December 1944. Major Guy Valentine Cartwright of the Duke of Wellington's West Riding Regiment. Son of Major Harold Cartwright and Mildred Francis Cartwright and husband of Loveday Cartwright of Wimbledon, Surrey. Died 22 March 1945 aged 29. Commander Sir Edward George Chichester of the Royal Navy, HMS President. Son of Rear Admiral Sir Edward and Lady Chichester and husband of Lady Chichester (formerly Fordham) of Instow. Born in the March Quarter of 1883. Died 26 September 1940 aged 57. He also served in the 1914-1918 war. Leading Stoker Edward George Colegate of the Royal Navy, HMS Courageous. Son of George and Annie Colegate and husband of E. L. Colegate of Instow. Born in Folkestone in 1901. Died 17 September 1939 aged 39. Chief Petty Officer Frederick William Dark of the Royal Navy, HMS Drake. Born in the March Quarter of 1889. Died 7 October 1942 aged 53. Buried in the churchyard at Instow. Petty Officer Stoker William James Harris of the Royal Navy, HMS Courageous. Son of John and E. G. Harris of Instow. Born in the December Quarter of 1895 in Instow. Died 17 September 1939 aged 43. Flight Sergeant Pilot Walter Charles Pope of the RAF Volunteer Reserve, 115 Squadron. son of Daniel and Elisabeth Pope of Instow. Died 23 March 1944 aged 23. Buried in the churchyard at Instow. Sergeant Norman Ernest Rattenberry of the Army Physical Training Corps. Son of Mr. and Mrs. E. A. Rattenberry of Instow. Died 23 December 1941 aged 26. Buried in the churchyard at Instow.